The property includes 3 bedrooms, 2 doubles and 1 single, sleeping up to 5 guests. Furnished to a high standard, Swift Cottage is perfectly situated for enjoying the breathtaking scenery, outdoor activities, bustling market towns, historic properties and the many other attractions and locations that the area has to offer. It provides everything you will need for recuperating after a hard day out in the great outdoors, sunbathing or relaxing with your feet up, in front of the cosy log burning stove. The modern kitchen-diner is well equipped with electric oven & gas hob, dishwasher, microwave, toaster, kettle & fridge-freezer. At the bottom of the original staircase is the recently refurbished, comfortably sized bathroom, with stone tiled floor, powerful shower fed by the combination boiler, washbasin, heated towel rail & lavatory. Bedroom 1 - A very spacious & light room with a double bed, chest of drawers & wardrobe. 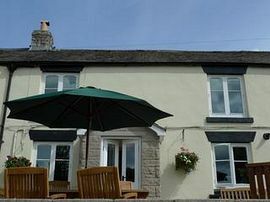 Both bedrooms 1 & 2 have stunning views over the dale. Bedroom 3 - A single bedroom with wardrobe. Large Outdoor area , Pet Friendly and Secure. Dogs allowed at NO CHARGE. Please do not allow upstairs. Large patio and outdoor seating, enclosed garden and terrace perfect for outdoor dining. £600 High Season and Major Holidays. This lovely cottage had everything we needed. Secure garaged parking for the motorbike, off road parking just behind the cottage for your car and a refreshing relaxed attitude towards our two little dogs! The cottage was clean, well equipped and cosy with very comfortable beds (welcomed after a tough days hiking - as was the lovely big bath for a well deserved soak). A sun terrace to both front and back we didn't spend enough time in! and an extremely handy porch space to the rear for muddy boots, fishing equipment, cleaning the dogs feet etc etc. Lovely fish and chip shop within walking distance as was the co-op, local stores and 3 very charming pubs - definately eat at the Horse and Jockey - food was lush!! No more than 30 minutes drive to get to any of the beautiful walks or coarse fishing lakes. The Darley Moor Circuit is also close by.All in all despite a little dampness in the weather :) a peaceful and relaxing break! Thank you!